[First, Webb’s launch as been delayed by the need to launch BepiColumbo is a critical time period. https://sciencesprings.wordpress.com/2017/08/06/from-spaceflight-insider-james-webb-space-telescope-may-be-delayed-again/ . The much delayed and over budget next-generation James Webb Space Telescope (JWST) has suffered another setback prior to its journey to the launch pad: the October 2018 launch may be in conflict with Europe’s BepiColombo mission to Mercury. Both spacecraft are to be flown on Ariane 5 boosters, but the spaceport at Kourou, French Guiana, cannot support two flights in the same month. BepiColombo has priority due to the tight launch window to reach Mercury. This will result in the JWST having its launch date pushed back to 2019 at the earliest. The JWST is a space-based infrared telescope. To operate properly, it needs to maintain a temperature of 37 kelvins (–236 °C / –393 °F). 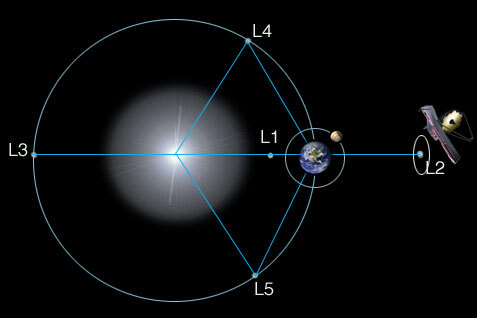 In order to achieve this when in space, the telescope relies on a large tennis court sized sunshield to protect it from external heat and light sources, such as the Sun as well as the Earth and Moon. Light gathered from the segmented 6.5-meter (21-foot) diameter mirror is directed to the four science instruments: Fine Guidance Sensor / Near InfraRed Imager and Slitless Spectrograph (FGS/NIRISS), Mid-InfraRed Instrument (MIRI), Near InfraRed Camera (NIRCam), and Near InfraRed Spectrograph (NIRSpec). Due to the requirement of the MIRI to operate at an even lower temperature than the other science instruments, it will utilize a cryocooler to decrease its temperature to less than 7 kelvins (–266 °C / –447 °F). While smaller than telescopes here on Earth, the JWST is the most powerful space telescope ever constructed and is the science successor to the Hubble telescope. Originally projected to cost $1.6 billion, the telescope’s price tag has ballooned to over $8.8 billion. Several factors, from delays in choosing a launch vehicle to management issues, contributed to the soaring costs. Additionally, the vehicle proved harder to construct than originally envisioned. For example, during vibration testing, the spacecraft experienced several anomalies that required NASA engineers to stop the test. After analysis and modifications, the tests resumed and the JWST was given a clean bill of health. Despite the technical issues and threats of cancellation, the project continued and the cost estimates grew. A launch delay into 2019 will only add to that dollar figure. BepiColombo is a mission to explore the planet Mercury that is being conducted by the European Space Agency (ESA) and the Japan Aerospace Exploration Agency (JAXA). The mission is actually two spacecraft: the Mercury Planetary Orbiter (MPO) and the Mercury Magnetospheric Orbiter (MMO). The objective is a comprehensive study of Mercury, including the planet’s surface, magnetic field, and interior structure. The MPO is a solar-powered spacecraft carrying 11 scientific instruments. These instruments include laser altimeters, spectrometers, magnetometers, as well as several cameras. It has a mass of 1,150 kilograms (2,540 pounds) and is capable of producing 1,000 watts of power for onboard instruments. The MMO has a mass of 285 kilograms (628 pounds) and carries five scientific payloads. Built mostly by Japan, this spacecraft will study plasma particles including high-energy ions and electrons emanating from the planet. A third spacecraft, the Mercury Surface Element (MSE), a small lander craft, was removed due to budgetary issues. The two Mercury spacecraft are scheduled to arrive at the planet in 2025 after performing numerous flybys: one at Earth, two at Venus, and six at Mercury. The craft must launch sometime between October 5, 2018, and November 28, 2018, to reach the planet as scheduled. Both missions as slated to fly on the Ariane 5 booster. The 52-meter (171-foot) vehicle is capable of lifting over 10,500 kilograms (23,100 pounds) to Geosynchronous Transfer Orbit (GTO). Currently, the JWST is undergoing low-temperature checks at NASA Johnson Space Center’s Chamber A. The temperature of the chamber is steadily being reduced to approximately 20 kelvins (–253 °C / –424 °F) – the same temperature that the JWST will be when operating in space. These tests will validate that the JWST instruments can operate properly at the extremely low temperatures. Unlike Hubble, the JWST will be positioned at the Earth-Sun Lagrange point (L2) which is 1,500,000 kilometers (930,000 miles) from Earth. That location is currently beyond NASA’s manned space capabilities; therefore, precluding the JWST from being serviced on orbit. The James Webb Space Telescope is prepared for cryogenic-temperature testing in Chamber A at NASA’s Johnson Space Center in Texas. Being a ‘cool’ telescope, JWST is designed to operate at very low temperatures (around -230° C). 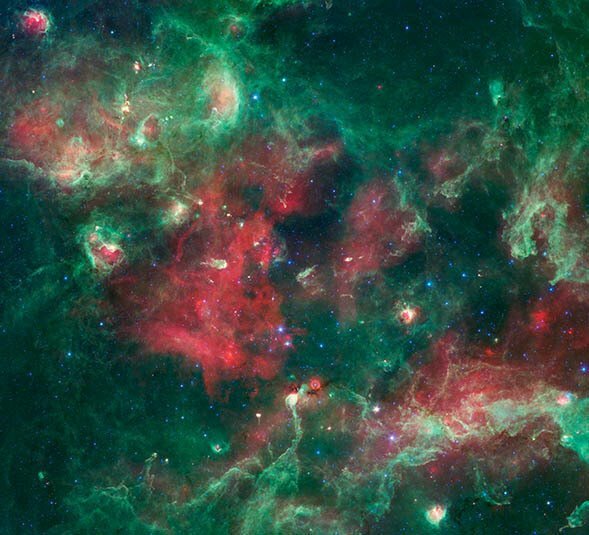 This will give us an unprecedented view of the Universe at near and mid-infrared wavelengths and will allow scientists to study a wide variety of celestial objects, ranging from planets in the Solar System to nearby stars, from neighbouring galaxies out to the farthest reaches of the very distant Universe. JWST is joint project of NASA, ESA and the Canadian Space Agency, and is scheduled for launch in October 2018 from Europe’s Spaceport in Kourou, French Guiana. More about the cryogenic-temperature testing on NASA’s JWST website. 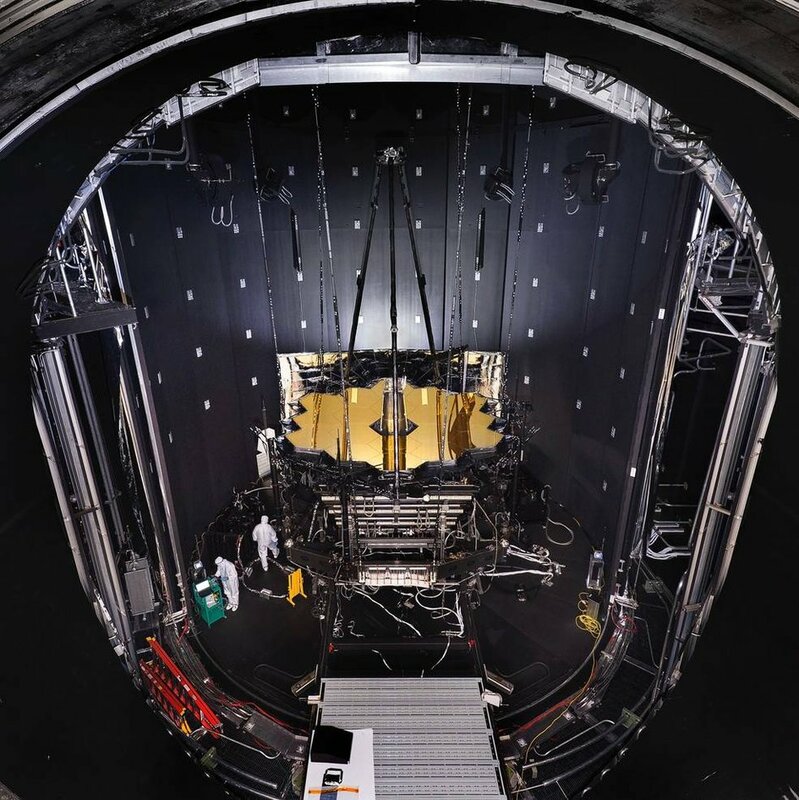 After completion of its vibration and acoustic testing in March, the James Webb Space Telescope – JWST – is shown here undergoing a detailed ‘lights out’ inspection in one of NASA’s cleanrooms at the Goddard Space Flight Center. By the end of April, the telescope and the instruments will be shipped from NASA Goddard Space Flight Center in Maryland to Johnson’s Space Center in Texas where, over the course of the summer, it will go through final cryogenic-temperature testing. JWST is joint project of NASA, ESA and the Canadian Space Agency, and is scheduled for launch in October 2018 from Europe’s Spaceport in Kourou, French Guiana. This image was first published on 15 March via the NASA JWST pages. As mentioned previously, this “sun scope” is not the only highly advanced space-imaging technology that’s surfacing. The James Webb Space Telescope, set to launch in October of 2018, will hopefully continue and advance the incredible work of the Hubble Telescope. 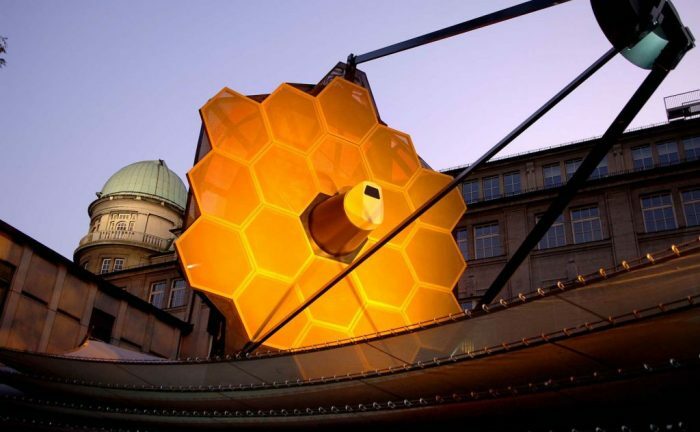 The James Webb Space Telescope (JWST, or the Webb) may be the most eagerly anticipated of the Super Telescopes. Maybe because it has endured a tortured path on its way to being built. Or maybe because it’s different than the other Super Telescopes, what with it being 1.5 million km (1 million miles) away from Earth once it’s operating. If you’ve been following the drama behind the Webb, you’ll know that cost overruns almost caused it to be cancelled. That would’ve been a real shame. The JWST has been brewing since 1996, but has suffered some bumps along the road. That road and its bumps have been discussed elsewhere, so what follows is a brief rundown. Initial estimates for the JWST were a $1.6 billion price tag and a launch date of 2011. But the costs ballooned, and there were other problems. This caused the House of Representatives in the US to move to cancel the project in 2011. However, later that same year, US Congress reversed the cancellation. Eventually, the final cost of the Webb came to $8.8 billion, with a launch date set for October, 2018. That means the JWST’s first light will be much sooner than the other Super Telescopes. The Webb was envisioned as a successor to the Hubble Space Telescope, which has been in operation since 1990. But the Hubble is in Low Earth Orbit, and has a primary mirror of 2.4 meters. The JWST will be located in orbit at the LaGrange 2 point, and its primary mirror will be 6.5 meters. The Hubble observes in the near ultraviolet, visible, and near infrared spectra, while the Webb will observe in long-wavelength (orange-red) visible light, through near-infrared to the mid-infrared. This has some important implications for the science yielded by the Webb. 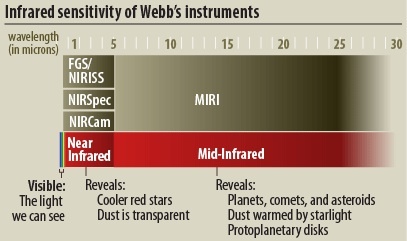 The NIRCam is Webb’s primary imager. It will observe the formation of the earliest stars and galaxies, the population of stars in nearby galaxies, Kuiper Belt Objects, and young stars in the Milky Way. NIRCam is equipped with coronagraphs, which block out the light from bright objects in order to observe dimmer objects nearby. NIRSpec will operate in a range from 0 to 5 microns. Its spectrograph will split the light into a spectrum. The resulting spectrum tells us about an objects, temperature, mass, and chemical composition. NIRSpec will observe 100 objects at once. MIRI is a camera and a spectrograph. It will see the redshifted light of distant galaxies, newly forming stars, objects in the Kuiper Belt, and faint comets. MIRI’s camera will provide wide-field, broadband imaging that will rank up there with the astonishing images that Hubble has given us a steady diet of. The spectrograph will provide physical details of the distant objects it will observe. The Fine Guidance Sensor part of FGS/NIRISS will give the Webb the precision required to yield high-quality images. NIRISS is a specialized instrument operating in three modes. It will investigate first light detection, exoplanet detection and characterization, and exoplanet transit spectroscopy. First Light and Re-ionization: In the early stages of the Universe, there was no light. The Universe was opaque. Eventually, as it cooled, photons were able to travel more freely. Then, probably hundreds of millions of years after the Big Bang, the first light sources formed: stars. 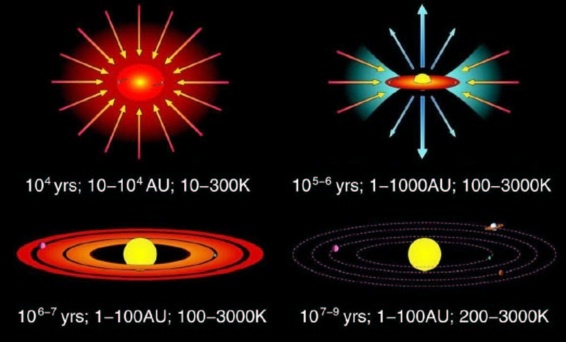 But we don’t know when, or what types of stars. How Galaxies Assemble: We’re accustomed to seeing stunning images of the grand spiral galaxies that exist in the Universe today. But galaxies weren’t always like that. Early galaxies were often small and clumpy. How did they form into the shapes we see today? 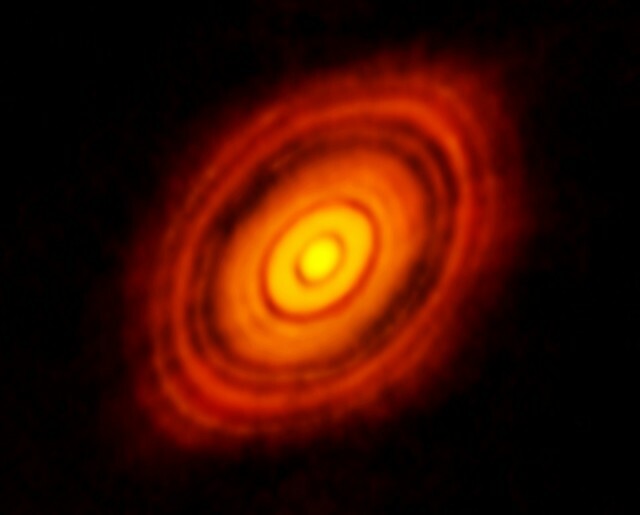 The Birth of Stars and Protoplanetary Systems: The Webb’s keen eye will peer straight through clouds of dust that ‘scopes like the Hubble can’t see through. Those clouds of dust are where stars are forming, and their protoplanetary systems. What we see there will tell us a lot about the formation of our own Solar System, as well as shedding light on many other questions. Planets and the Origins of Life: We now know that exoplanets are common. We’ve found thousands of them orbiting all types of stars. But we still know very little about them, like how common atmospheres are, and if the building blocks of life are common. These are all obviously fascinating topics. But in our current times, one of them stands out among the others: Planets and the Origins of Life. The recent discovery the TRAPPIST 1 system has people excited about possibly discovering life in another solar system. TRAPPIST 1 has 7 terrestrial planets, and 3 of them are in the habitable zone. It was huge news in February 2017. The buzz is still palpable, and people are eagerly awaiting more news about the system. That’s where the JWST comes in. One big question around the TRAPPIST system is “Do the planets have atmospheres?” The Webb can help us answer this. The NIRSpec instrument on JWST will be able to detect any atmospheres around the planets. Maybe more importantly, it will be able to investigate the atmospheres, and tell us about their composition. We will know if the atmospheres, if they exist, contain greenhouse gases. The Webb may also detect chemicals like ozone and methane, which are biosignatures and can tell us if life might be present on those planets. You could say that if the James Webb were able to detect atmospheres on the TRAPPIST 1 planets, and confirm the existence of biosignature chemicals there, it will have done its job already. Even if it stopped working after that. That’s probably far-fetched. But still, the possibility is there. The science that the JWST will provide is extremely intriguing. But we’re not there yet. There’s still the matter of JWST’s launch, and it’s tricky deployment. 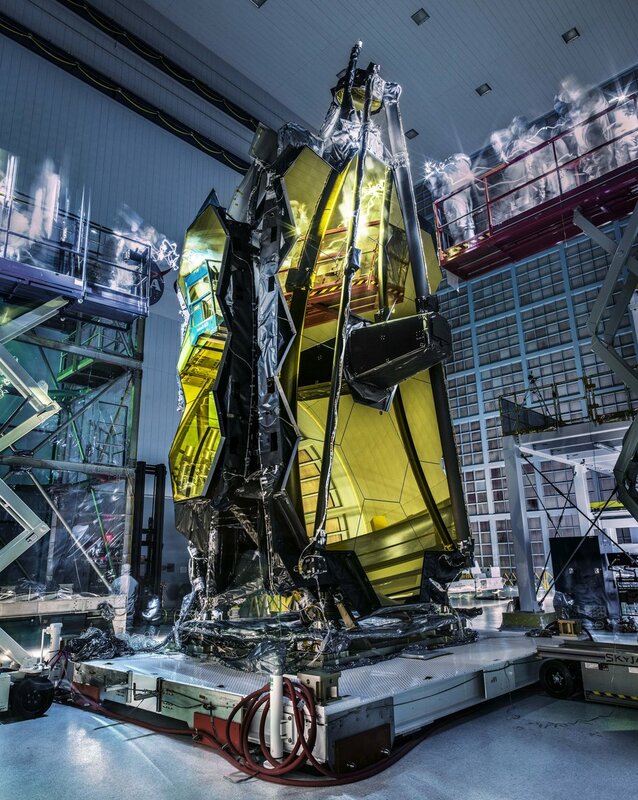 The JWST’s primary mirror is much larger than the Hubble’s. It’s 6.5 meters in diameter, versus 2.4 meters for the Hubble. The Hubble was no problem launching, despite being as large as a school bus. It was placed inside a space shuttle, and deployed by the Canadarm in low earth orbit. That won’t work for the James Webb. The Webb has to be launched aboard a rocket to be sent on its way to L2, it’s eventual home. And in order to be launched aboard its rocket, it has to fit into a cargo space in the rocket’s nose. That means it has to be folded up. The mirror, which is made up of 18 segments, is folded into three inside the rocket, and unfolded on its way to L2. The antennae and the solar cells also need to unfold. Unlike the Hubble, the Webb needs to be kept extremely cool to do its work. It has a cryo-cooler to help with that, but it also has an enormous sunshade. This sunshade is five layers, and very large. We need all of these components to deploy for the Webb to do its thing. And nothing like this has been tried before. The Webb’s launch is only 7 months away. That’s really close, considering the project almost got cancelled. There’s a cornucopia of science to be done once it’s working. But we’re not there yet, and we’ll have to go through the nerve-wracking launch and deployment before we can really get excited. In 1990, NASA launched the Hubble Space Telescope. This observatory would come to revolutionize not only our scientific understanding of the Universe, but would reveal to humanity, for the first time, what our Universe actually looked like. 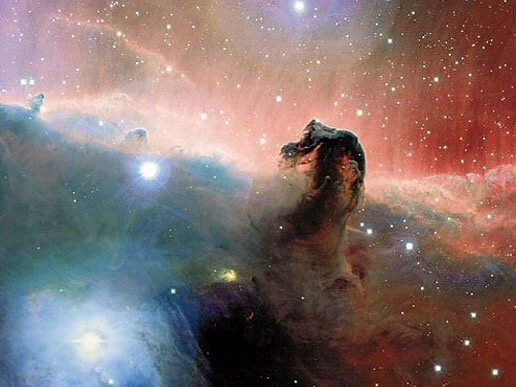 We could peer inside the densest, most gas-and-dust-rich star forming nebulae, and see exactly how and were stars were beginning to form. 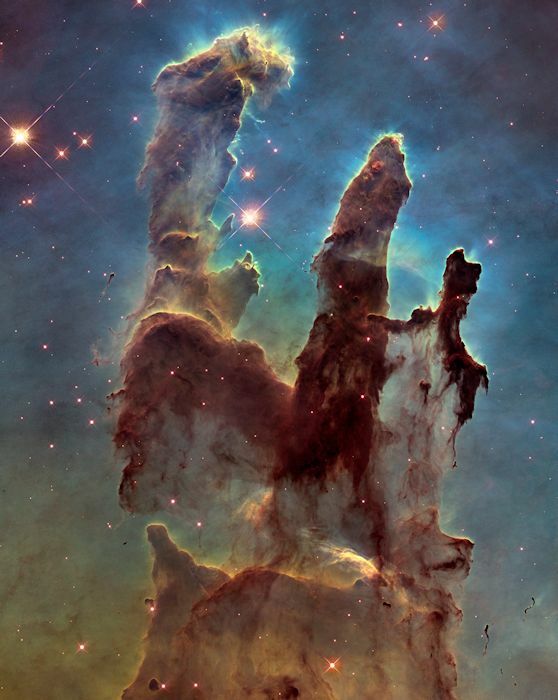 The pillars of creation, as taken for Hubble’s 25th anniversary. 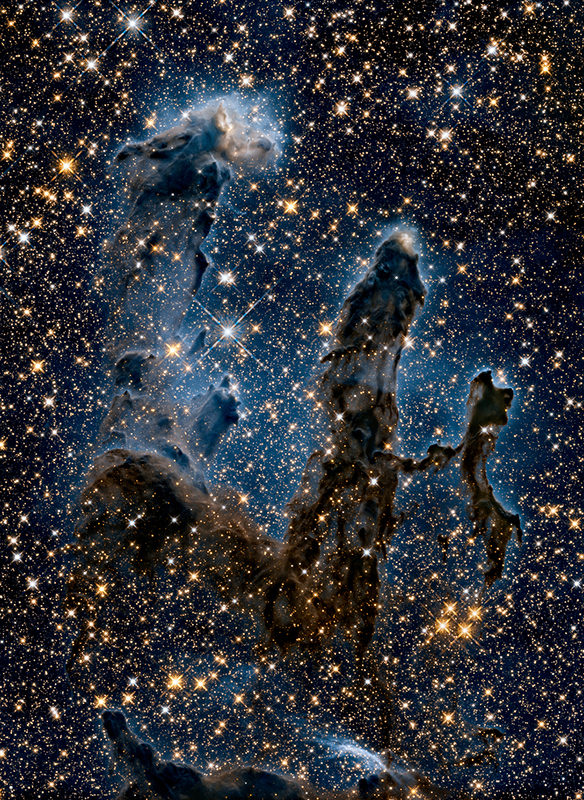 Image credit: NASA, ESA, and the Hubble Heritage Team (STScI/AURA). We could look out at dying stars, reaching the end of their lives, and see exactly what their final moments in the Universe looked like. Four individual planetary nebulae — He 2-47, NGC 5315, IC 4593, and NGC 5307 — were imaged by Hubble in February of 2007. 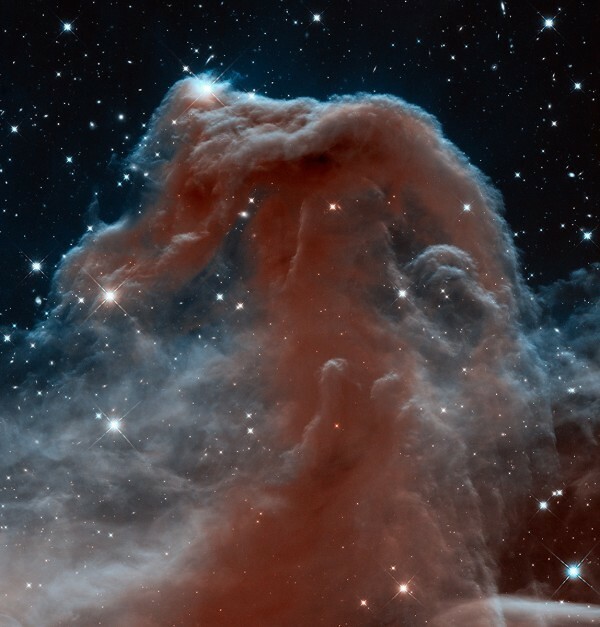 Image credit: NASA, ESA, and The Hubble Heritage Team (STScI/AURA). We could look out at distant galaxies, and reveal their shapes, ages, stellar populations and histories with simply a glimpse. The irregular, interacting galaxy pair Arp 230. Image credit: ESA/Hubble & NASA. Acknowledgement: Flickr user Det58. We could look out at the largest gravitationally bound structures in the Universe, and see how mass bent starlight, giving us a firsthand, visual look at the stunning phenomenon of gravitational lensing. Gravitational lensing in galaxy cluster Abell S1063, showcasing the bending of starlight by the presence of matter and energy. Image credit: NASA, ESA, and J. Lotz (STScI). And perhaps most importantly of all, we were able to look into the vast abyss of nothingness, photographing what lies beyond our visual reach for hours, days or even weeks at a time. What we wound up seeing changed our view of everything. Thanks to Hubble, we now know how stars are born, live and die. We know how galaxies form and grow in the Universe. We know what the ultimate fate of our Universe will be, and where we’re headed in the future. But even without any of this scientific knowledge, Hubble taught us something absolutely incredible: it showed us that this is what our Universe looks like. By the same token, the James Webb Space Telescope will teach us an incredible amount about the Universe, including further details about how stars form, what the earliest stellar populations look like, will show us gas giants and rogue planets in unprecedented detail and will tell us what made up the Universe at any given time in the past. It will show us a whole slew of things that Hubble cannot, by virtue of it reaching to much longer wavelengths of light than Hubble could ever hope to see. And with its huge, large-aperture primary mirror, it will be able to collect more light in a single day than Hubble could in a week. The most exciting things, of course, will be the unexpected: the things we’ll discover that we don’t even know to look for yet. An artist’s conception of what the Universe might look like as it forms stars for the first time. Image credit: NASA/JPL-Caltech/R. Hurt (SSC). But even if you don’t learn about any of the science that James Webb will bring to us, there’s one thing it will deliver that everyone can enjoy: the James Webb Space Telescope will show us how the Universe grew up. An illustration of CR7, the first galaxy detected that’s thought to house Population III stars: the first stars ever formed in the Universe. JWST will reveal actual images of this galaxy and others like it. Image credit: ESO/M. Kornmesser. It will show us how the Universe went from the hot Big Bang and a state with no stars, no planets and no galaxies into the Universe we have today. It will reveal the very first populations of stars, which were created out of the pristine elements — hydrogen and helium alone — which provided the first light in the Universe. On the left, the infrared light from the end of the Universe’s dark ages is shown, with the (foreground) stars subtracted out. JWST will be able to probe all the way back to the very first stars of all. Image credit: NASA/JPL-Caltech/A. Kashlinsky (GSFC). It will reveal how these first stars grew into star clusters, dwarf galaxies and eventually massive behemoths like our own. It will show us how the neutral atoms became ionized, and transparent to visible light. It will show us when and where the Universe became filled with oxygen, carbon and nitrogen: the elements essential to life. In short, it will tell us how the Universe went from being an inhospitable, smooth complex of pristine gas to the rich, diverse set of planets, stars, galaxies, clusters and great cosmic voids we enjoy today. The biggest ‘big idea’ that JWST has is to reveal to us the very first luminous objects in the Universe, including stars, supernovae, star clusters, galaxies, and luminous black holes. Image credit: Karen Teramura, UHIfA / NASA. 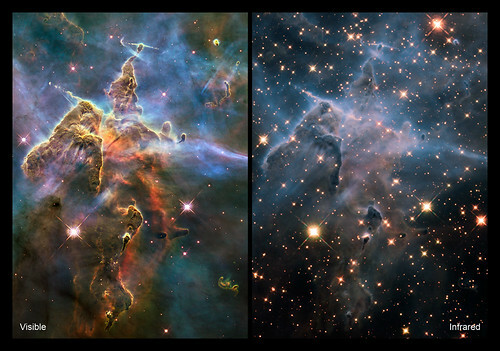 Hubble showed us what the Universe looks like; James Webb will show us how the Universe came to be the way it is today. Don’t ever say that James Webb is the “next Hubble,” it isn’t and it should never be. Instead, it’s the first James Webb, and when it starts returning images of the Universe, you may never look at your place in the Cosmos the same way again.